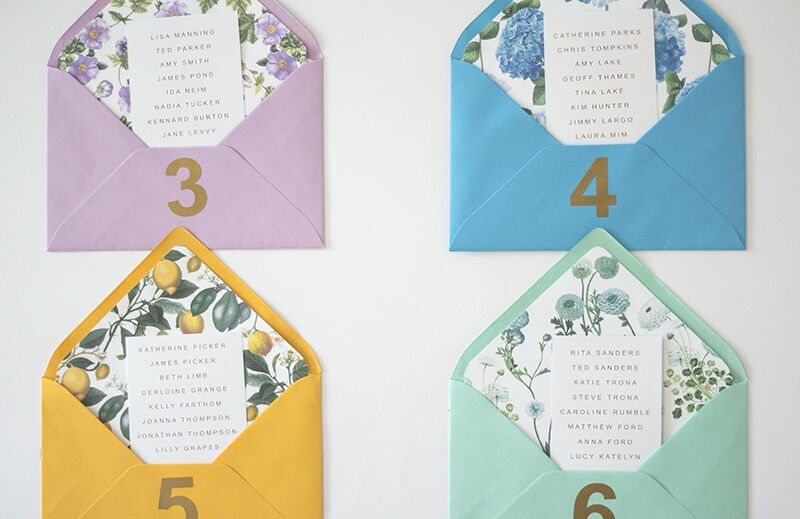 PRETTY ENVELOPE TABLE PLAN WITH FREE PRINTABLE FLORAL LINERS! Step 1: Cut out your envelope liners following the guides marked. Step 2: Slot into the envelopes and position. Then glue or stick with double sided tape the back of the flap to the inside of the envelope. Step 3: Lay the envelopes out on the whiteboard to see what order you want them in and then stick your number stickers to the bottom of each so that the number and envelope liner are front facing. Step 4: Stick each envelope to the board with glue or double sided tape. You may want to measure equally in from the sides and between each envelope to make sure the layout is even. Mark these out faintly with a pencil. Step 5: Write or type the guest list for each table in a column and print out. Cut each list out and slot into the envelopes that it pokes out and all the names are visible. You can secure this with glue or double sided tape. Step 6: Make two holes along the top edge of the board. Measure an equal distance in from each side and using a scalpel on top and blue tack directly underneath the board, push through until the bladed goes through to the tack. Wiggle it around to create a space big enough for the twine to go through. Step 7: Thread the twine through and tie so the table plan can be hung. Tada! You have a table plan that your guests won’t have seen before. You get the satisfaction of making it yourself but have the ease of it being very little work. More time to spend on other wedding details! You can see more DIY’s from The Lovely Drawer Here!